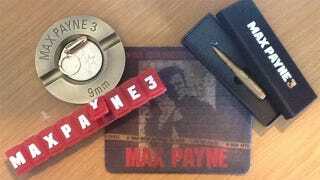 Today, Rockstar was kind enough to send me a copy of Max Payne 3, along with some violent (but cool) promotional swag. A bullet keychain, a t-shirt with some bullets on it, another bullet in a box, and… a pill container. Also, a nifty ashtray that I could probably melt down and make into bullets. I laid the stuff out on my desk, and it hit me. Sitting right next to this shiny new promotional junk was my crusty, trusty Max Payne mousepad. I've had that mousepad since I bought the original Max Payne back in 2001. I still remember buying it - PC Gamer magazine had me really looking forward to playing the game, and so I walked into Target close to opening day and picked it up. This was before I was even aware that people camped out for video game launches. I heard the game had finally been released, so I thought, "Cool, I'll go pick it up." It came bundled with the mouse pad. It seems like a silly prize, but it actually was pretty cool. It featured the same art as the box—a stencil-graffiti depiction of Max's visage, holding one of his trademark Berettas and looking much younger and cleaner-cut than he does today. Across the image, police tape was draped. "Do not cross - a man with nothing to lose." I thought it was a pretty cool mousepad, so I kept it. And kept it. And kept it. Eleven years later, I still use it as my mousepad. I'm sure it's covered in more dried coffee, food particles and other unmentionable gunk than Max himself, but it's still my mousepad. Looking at all this shiny new swag (and thinking about this shiny-looking new game), I took a moment to reflect on the last decade of gaming, on how much has changed. "This isn&apos;t going to end well." And, given that this week we're spending our time playing Diablo and Max Payne, how much has stayed the same. Maybe I'll finally chuck this nasty old thing and get myself a new, proper mousepad.